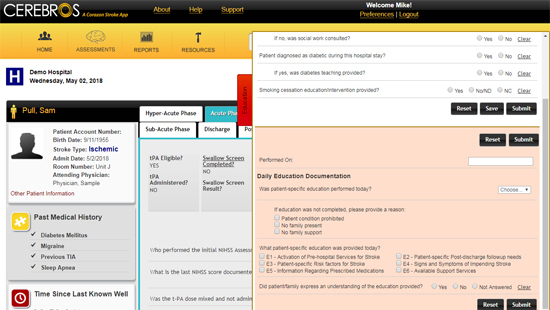 The first true Neurovascular Information System! CEREBROS™ is Corazon’s Neurovascular Information System for the management and navigation of stroke patients, the first of its kind. It is changing the way hospitals deliver care to stroke patients – from arrival and critical early timeframes through discharge. CEREBROS™ uses visual cues and work flows as a driver to ensure best practice care is consistently delivered, 24/7/365. 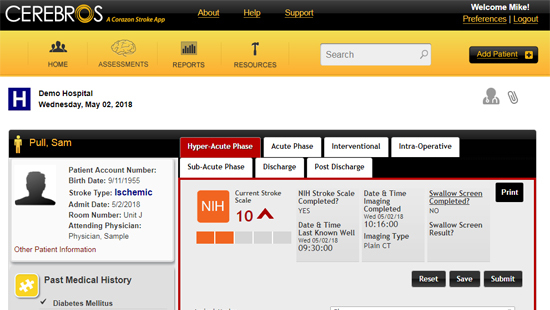 CEREBROS™ is on the American Heart Association list of Standard Uploader Vendors for data interface solutions for Get With The Guidelines – Stroke and is also built to support certification or accreditation through any of the national organizations. With the release of Version 2.0 and the Interventional Module, CEREBROS™ now supports the full range of endovascular and surgical interventional stroke patients. CEREBROS™ was also built on a platform to promote real time interfacing with EMRs and other systems to maximize efficiency. 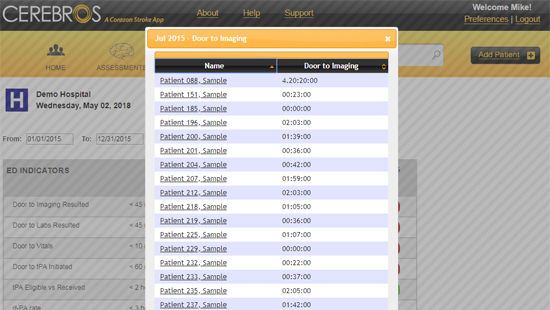 CEREBROS™ eliminates retrospective chart view and saves time and resources with point-of-care data entry. CEREBROS™ can interface with systems such as ADT, EMR, Labs, and PACS. 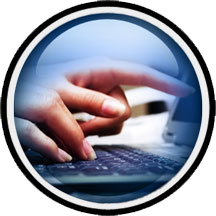 It’s also HL-7 compliant, and can be used on desktops, laptops and tablets! 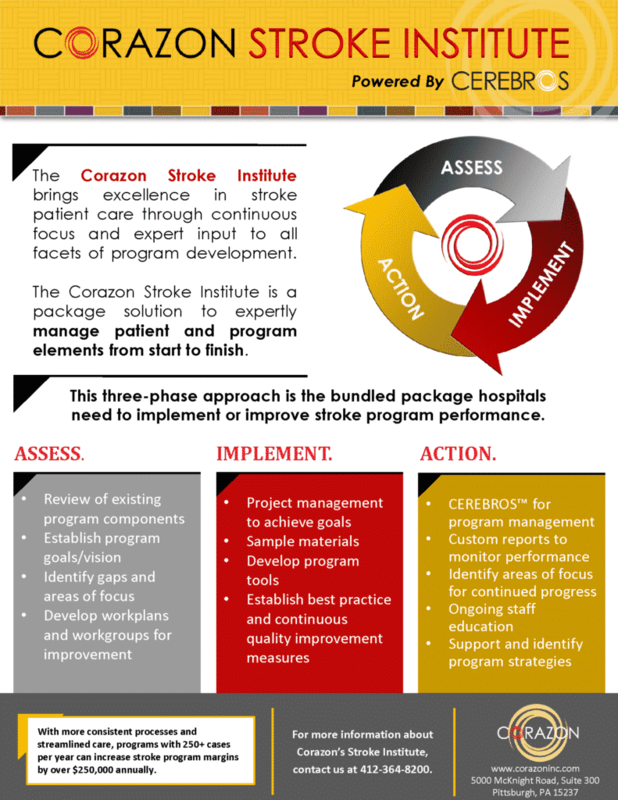 CEREBROS™ drives care systemization for 24/7/365 consistency and allows for real-time process improvement to affect care. 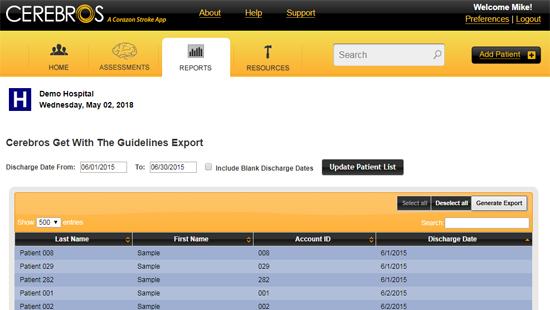 CEREBROS™ and its web-based interface (available via secure internet connection) allows staff to input, import, track, monitor, discharge, and report on any stroke patient, anywhere in the hospital, anytime. CEREBROS™ uses best-practice quality care standards as a driver to ensure the RIGHT care is delivered at the RIGHT time to the RIGHT patient. 24/7/365. Ready to make a real difference in the stroke care you provide? CEREBROS™ will change the way hospitals deliver care to stroke patients – from arrival, in the critical early timeframes, through discharge and beyond. 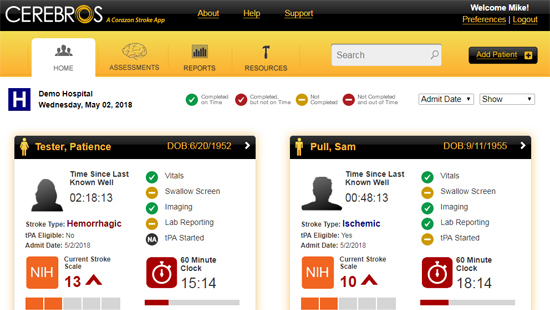 Make a real difference in the stroke care you provide – and watch clinical outcomes improve, operational efficiency increase, and revenue grow.